July 13, 2018, 10:42 a.m. Imagine if a news photographer at a football game had to get permission from every single person in the stadium before taking a single shot — or else face hundreds of civil lawsuits. That’s what new model legislation wants to bring to public airspace. By Judd Slivka July 13, 2018, 10:42 a.m.
It’s a crisp autumn day and the news director has asked for drone video of fall colors. You know just the place: a rise aside a subdivision that borders a state park whose oaks and sugar maples are a riot of colors. You take off and, with camera pointed forward, fly a conservative 80 feet above 13 of the subdivision’s homes en route to the state park. The combination of homes in the foreground and a wall of fall color in the background makes a great composition. And, if one semi-official group gets its way, it also exposes you to at least 13 civil suits for trespassing. And more legal exposure capturing video of those 13 houses. In 1946, the U.S. Supreme Court decided that the airspace above us belonged to the federal government. A 1962 court decision affirmed that federal law pre-empted local laws when it came to aviation. But if it’s up to the National Conference of Commissioners on Uniform State Laws (more often known as the Uniform Law Commission), homeowners and states will control the lower 200 feet of that airspace — and property owners will have rights that could create a chilling effect on the media’s use of drones. The group is scheduled to discuss it at its annual meeting July 21-25. It’s possible that the ULC may have outkicked its coverage; the Federal Aviation Administration’s general counsel sent the group a letter this week stating it had misrepresented the federal agency’s viewpoints in drafts of its model rule and that “decades” of precedent contradicted what the ULC was trying to accomplish. But the group’s effort comes at a time when the field of drones and their use is changing rapidly. Rapid change brings fear, such as this story from Atlanta in which a woman claims to have seen a drone peering through her window as she got dressed. Rapid change also creates chaos — and that often creates an opening to create new regulations. There’s a market for these sorts of regulations. Municipalities across the country are trying to regulate airspace that isn’t legally theirs. Newton Falls, Ohio, wants to prohibit drones flying above schools, parks, and municipal buildings — and prohibit any kind of photography or videography of public or private property that can’t be done from the ground. Kitsap County, Washington, wants to bar drones from launching or landing within 3,000 feet of naval bases there. The ULC’s proposed drone regulations are part and parcel with these. They would make it a civil offense to fly a drone over private property at less than 200 feet without permission. 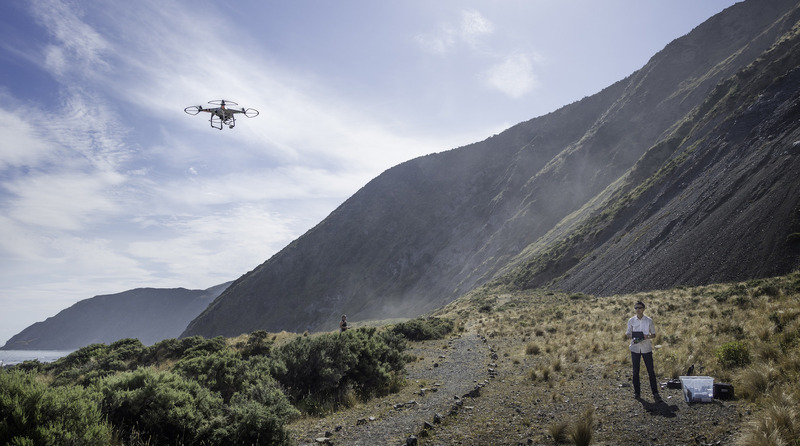 Beyond that, a landowner could sue for per se aerial trespass — he or she wouldn’t even need to show damages from the drone passing over the property. This would be a law with deep reach. It would virtually cripple the emerging roof inspection and aerial videography sectors that use drones. And though the draft legislation specifically exempts “any activity protected by the First Amendment,” it still allows a suit to be filed, as it doesn’t hold the media exempt from private landowners’ lawsuits. A drone operator can still be found in violation of the law taking pictures of a private property from a public place. It is “offensive” if the image cannot be gathered from the ground. The first presumption means that you can’t, say, hover over a public space like a road or park and shoot into someone’s backyard — even if there is something newsworthy going on. Most of the time, journalists aren’t shooting into backyards. But what if there’s a fire deep in a tire recycling facility? Or on a privately held timber reservation? News helicopters aren’t restricted from flying over or shooting from public spaces because they fly above the minimum safe altitude established by the FAA, which is a bright line for federally defined airspace. But media drones — the choice of newspapers and small-market TV stations that don’t want to spend $1,000-an-hour for a helicopter — can’t fly over 400 feet in most cases. The first section of the model law makes flying over private property without express consent grounds for a civil suit, even if there’s no damage. The law’s two presumptions make gathering news from an aerial platform all but impossible without significant legal risk. Let’s take a real-life example: The Meramec River floods the communities outside of St. Louis and various news outlets obtain, either from their own staffers or freelancers, drone imagery of the breadth of the flooding. The drone’s path takes it over the main channel of the river, which is a public space. But the images capture flooded private property. The proposed legislation enables those private landholders whose land is photographed or caught on video to sue. The legislation creates an exception for First Amendment behavior (which taking a news photograph is) — but that throws the case into court systems that inconsistently define what is and isn’t protected First Amendment behavior. The second presumption establishes a low bar for “offensive” behavior — and gives a landholder a toehold for harassing litigation. Let’s say you’re the owner of the chemical facility that’s on fire. The facility is set a half-mile back from the nearest public road, but it’s adjacent to a park. The local newspaper puts a drone up at 150 feet and gets a stunning photo of the flames leaping out of your improperly stored chemical tanks and the smoke plume blowing over a nearby neighborhood. It’s a newsworthy photo by any definition. The drone flew over the park and never entered your property’s boundary. The photo was taken in airspace that is (a) demonstrably not private and (b) more importantly, part of an arguably public byway, the National Airspace. But the very fact that a picture was taken above ground level opens the door to a lawsuit under the proposed legislation. Could it happen? Sure. If you were that chemical company you’d have a way to hit back at the newspaper — and send a message to other media outlets. Let’s go back to the flooded St. Louis suburbs. Propane and septic tanks ripped off their moorings are a regular sight in floods. Let’s say the water pushed a collection of them next to a flooded factory. A media-operated drone gets a shot of the tanks eddying next to a fallen electric line. If the line arcs, the factory goes boom. That’s a newsworthy image in and of itself. But this proposed legislation makes the drone operator civilly liable for capturing the images, even if it comes from a public space. And if the drone were to move 250 feet west of the main channel and hover over flooded private land, the drone operator has now committed per se aerial trespass as well. You can follow every FAA rule, but it’s a state civil law that doesn’t even require damage that could keep you from flying. The ULC was established in 1892 to give states model laws they can enact for the purposes of uniformity. Every state nominates members to the commission and they work in different subgroups to write these model laws. One analysis by George Mason University law professors found that the committee’s broad influence can cause laws to be adopted, even if they’re inefficient; it also found that the group’s laws often benefit some interest groups over others. So let’s look at the subcommittee writing the drone laws and who they represent. The members include a former dean of the University of Georgia’s law school; an attorney who handles government compliance and regulations for corporate clients; an intellectual property law expert with experience on Wall Street; a corporate lawyer who represents large companies getting government contracts; three current or former state legislators; a private-property rights attorney; and a retired D.C. Superior Court Judge with a background in civil rights and labor cases. It also includes a Pepperdine University law professor named Gregory McNeal, who is the cofounder of the air operations services company AirMap and is a polarizing figure in the drone community, mostly because of his potential conflicts of interest. This is a group with a lot of corporate representation. Missing? Anyone with First Amendment or aviation law practice. Also missing: Anyone who has a commercial drone operators license from the FAA, according to a search of FAA records. Landowners own at least as much space above ground as they can use in connection with the land. How far do a state or local government’s rights extend into the air? The FAA’s commercial drone usage regulations restrict, in most cases, drone operators to 400 feet or less. The proposed law assigns the lower 200 feet of the airspace to state governments for the purpose of creating an aerial trespass offense. That is, you own the air from the blades of your grass to 200 feet, the same way you own the mud in your backyard. If someone walks across your property without your consent, that’s trespassing. Under the proposed model legislation, if someone flew a drone over your yard at 199 feet, they’d be trespassing. Here’s the problem: The legislation’s authors point out, rightly, that current aerial trespass law requires courts to engage in “fact-specific” investigation into whether an aircraft trespassed and more importantly, if there was any kind of actual damage from the trespass. The proposed legislation would essentially mirror land-trespass laws and make the drone operator liable for trespass “irrespective of whether he…causes harm to any legally protected interest of the other.” Unpacking that, you’re committing a crime by transiting someone’s property in a drone, even if you don’t crash it into their house or invade their privacy by hovering over their kids in the pool. Consider an unmanned aircraft hovering at 55 feet above a landowner’s property (note that the average two-story home is 35 feet tall). This aircraft would be visible to the landowner, perhaps audible to the landowner, and likely troubling to the land owner, but based on existing precedents would not necessarily constitute interference with the use of land, and therefore would likely not be actionable (or excludable from that airspace). News directors and photo editors have wrestled with invasion-of-privacy questions for years. But they’ve always sought protection via ethical rules and professional guidelines. News helicopter use has always been protected by the limitations of the National Airspace. The introduction of drones as a news tool — and the FAA’s limitation of them to 400 feet in altitude — has thrown many of the established conventions into question. Journalists have only had to deal with the issue of aerially transiting private property as an ethical issue and never a legal one. But inexpensive drones and the wherewithal to use them have changed that. So has a spate of “drones are spying on me” stories in the media. Predictably, there’s a legislative response. At least three states have created aerial privacy laws; the ULC’s efforts are just an attempt to create more consistent legal standards, albeit ones that hew to a strict interpretation of property rights. But the unintended consequences are worrisome: It’s nearly impossible to shoot aerial images of a house’s roof for a hail-damage inspection without being over a neighboring lawn for at least one or two shots, for instance. And real estate agents love aerial images of neighborhoods; that shot is now removed from the repertoire unless the drone operator gets specific, informed permission of every homeowner in the shot. The surveying industry has embraced drones; it will be harmed, too. If you’re doing mapping, you need to fly outside the boundaries of the property you’re mapping to photograph those boundaries. Any of the above become causes for civil action under the proposed model legislation. The chilling effect on the media may be the worst of all the (possibly) unintended consequences. The proposed legislation provides a tool for harassment and deterrence for those who wish not to be photographed or flown over, with a very low bar to enter the court system. I know of one broadcast company that’s so cautious with drone use that every flight from every station has to be mapped out and approved in advance by the corporate vice president for news. Laws like this might move a company like that from cautious approval to never even attempting drone flight. Because once a question for photographers and videographers becomes “Will you, under any circumstance, capture private property in the image?” the drone’s usefulness is largely lost. There’s no one on the Commission to advocate for the media — or the rest of the drone industry. One of the rationales of the group is that a rash of new litigation won’t spring from this because people don’t sue over trespass. That might be true. But in an increasingly litigious society, with increasingly small profit margins, the threat of suit to a media company could be enough to alter a coverage decision. It’s possible that the FAA’s letter to the ULC this week will kill this model legislation. But that’s questionable. Several property rights interests and municipalities are pushing for it. Yet others — delivery companies, air traffic control companies — want to get their drones in very-low altitude airspace. Despite many protestations to the contrary, the rights of the press may be among the first to be “accidentally” abridged. Judd Slivka is the first director of aerial journalism at the Reynolds Journalism Institute, where a version of this story originally appeared. He is also an assistant professor of convergence journalism at the Missouri School of Journalism. Photo by Andrew Xu used under a Creative Commons license. POSTED July 13, 2018, 10:42 a.m.
Slivka, Judd. "A new proposed law would turn drone journalism into a swarm of lawsuits and make it easy to sue over news photography." Nieman Journalism Lab. Nieman Foundation for Journalism at Harvard, 13 Jul. 2018. Web. 19 Apr. 2019. Slivka, Judd. "A new proposed law would turn drone journalism into a swarm of lawsuits and make it easy to sue over news photography." Nieman Journalism Lab. Last modified July 13, 2018. Accessed April 19, 2019. https://www.niemanlab.org/2018/07/a-new-proposed-law-would-turn-drone-journalism-into-a-swarm-of-lawsuits-and-make-it-easy-to-sue-over-news-photography/.